This is the very first step. After you completed this step successfully, you will be able to login to Phabricator with your DKFZ credentials and access all the following steps. For the moment, you can only see this step. 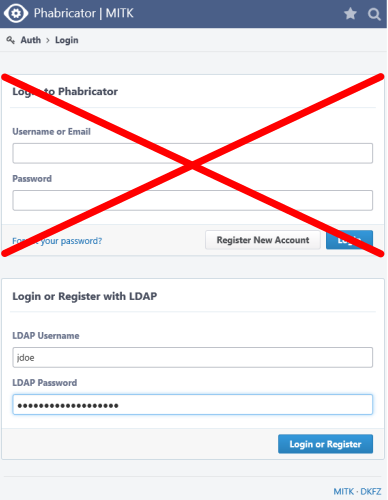 IMPORTANT: In the following, make sure to use the LDAP login form instead of the Username/Password login form. There are four groups in Phabricator that correspond to the joint departments CAMI, MIC, MICO, and SIDT. At this point, you should already know which is your department and hence your Phabricator group. Ask your tutor or any other colleague if you are uncertain. Anyone who is already a member of your group is able to add you as a member. Ideally, your tutor for the introduction day is in the same group and can add you right now. As soon as you are a member of any of the mentioned groups you can see and access all the following steps in the Document Hierarchy box of the Onboarding page. See you in the next step! kislinsk added a project: Onboarding. kislinsk added subscribers: nolden, kislinsk. kislinsk removed subscribers: kislinsk, nolden.